He's mused out loud, run it by his family, given Republicans a timetable for his decision-making, and now, former Florida Gov. 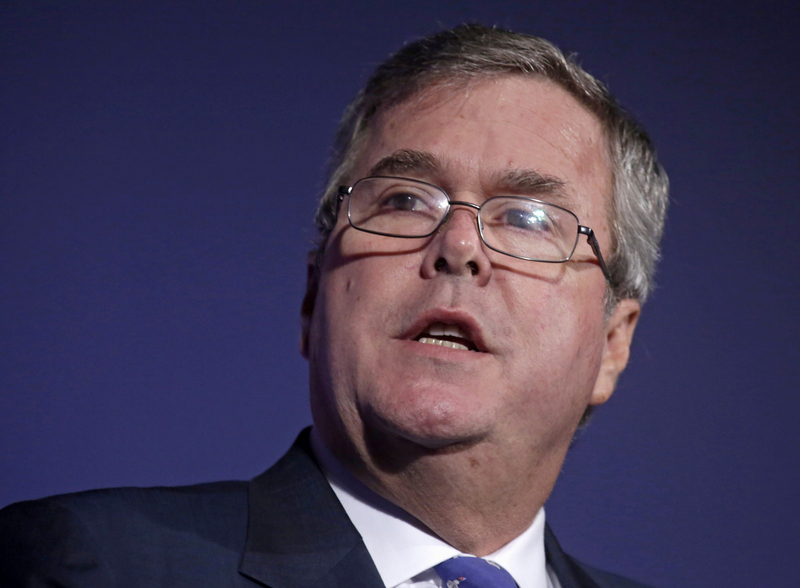 Jeb Bush has declared he will "actively explore" the possibility of a White House bid. That exploration will involve mapping out a viable path through the Republican primary process, and Bush has staked out positions on the Common Core educational standards and immigration that starkly differ from the positions many of his potential opponents have taken. Immigration will likely generate a fair amount of debate in light of President Obama's recent executive action to shield millions of undocumented immigrants from deportation, a move that has infuriated many on the right. Back in 1994, when he first ran for Florida governor, Bush sounded like many of his more conservative colleagues, telling the Miami Herald that the government should "start deporting people" who were here illegally. But in recent years, that tone has changed. A PolitiFact article that traces the evolution of Bush's views on immigration cites an email exchange with the Los Angeles Times from 2006 when he said it would be "just plain wrong" to charge illegal immigrants with a felony and suggested it was unfair to penalize their children by denying them the chance to become citizens. After former Gov. Mitt Romney advocated for reducing the population of illegal immigrants through "self deportation" in 2012, it was Bush who told CNN that, "there's a better way of saying we need to control the border," and Republicans needed to figure out how to be more respectful in their debate in order to avoid "turning people off." Romney ultimately won just 27 percent of the Latino vote, alarming Republican party leaders about their ability to win a fast-growing sector of the electorate. The Senate began work on a bipartisan immigration reform bill, and leaders in both parties sounded positive about the prospects for a comprehensive overhaul. It was in that context that Bush released his 2013 book, "Immigration Wars: Forging an American Solution." He argued that immigrants in the U.S. illegally should be able to pursue permanent legal resident status, but not citizenship, to maintain the "integrity of our immigration system." That seemed to contradict some past statements where he said he could support a path to citizenship, and within days of the book's release, he was saying once again that he could support a path to citizenship so long as it didn't incentivize people to come to the U.S. illegally in the future. Since then, the political winds have shifted sharply. House Speaker John Boehner, R-Ohio, declared the bipartisan Senate bill dead on arrival. Bush drew sharp criticism for characterizing illegal immigration as "an act of love" at an anniversary event for his father's presidential library. He defended those remarks, saying, "There is no conflict between enforcing our laws, believing in the rule of law and having some sensitivity to the immigrant experience, which is part of who we are as a country." In August, the Republican-controlled House ultimately ended up passing a bill that would bar Mr. Obama from continuing or expanding the Deferred Action for Childhood Arrivals (DACA) program, which suspends the threat of deportation for certain immigrants brought to the U.S. illegally as children. And after the president announced further executive actions on immigration after the midterm elections, many Republicans warned this would only make comprehensive immigration reform more difficult. Bush was one of those Republicans. "President Obama's ill-advised unilateral action on illegal immigration undermines all efforts to forge a permanent solution to this crisis...President Obama has once again put divisive and manipulative politics before the sober leadership and sound laws required of an exceptional nation," he wrote in a Facebook post. Yet he said it was all the more important that Congress pass meaningful immigration reform. "It is time for Republican leaders in Congress to act," he wrote. Jeb Bush defends calling illegal immigration an "act of love"
Immigration will likely continue to be a point of contention during the 2016 presidential primaries, and should Bush make a final decision to run, his support for legalization or citizenship will come under heavy scrutiny in the early contests in Iowa, New Hampshire and South Carolina. "They call anything that is not deportation by the "A" word - amnesty. [Bush] is going to have an A tattooed on his forehead," said Frank Sharry, the executive director of the pro-immigration reform America's Voice. But one person who knows Bush's stance on immigration best is sure that he will be ready to make a compelling argument for reforming the nation's immigration system. "He is not going to make the mistake that Mitt Romney made," said Clint Bolick, who co-wrote Bush's 2013 book on immigration. "If he's nominated, I believe he'll have a mandate on this issue and be able to speak to voters who have tuned out the Republican Party in the past." In an interview with CBS News, Bolick recalled the time he first pitched Bush on an immigration book. Bush had come to Arizona, where Bolick works as a lawyer, for a fundraiser about an unrelated issue. He was asked a question about how the government could stop the "hoards of people pouring over our southern border." Bolick described the response as "classic Jeb." "He said, 'let me rephrase that question: How can the Republican Party avoid committing suicide by continuing to alienate people who should be Republicans?'" Bolick recalled. That suggests that Bush would ignore any suggestions that he avoid discussing immigration during the primary so as not to antagonize the base. "He is absolutely committed to making this a central part of his message," Bolick said. Bush's stance on immigration would be received much more favorably by the broader group of voters that matter in the general election. A CBS News poll taken in August found that a majority of Americans - 54 percent - believe that illegal immigrants should be allowed to stay and apply for citizenship. Just 11 percent say they should be allowed to stay but not be given the chance to become citizens, and 30 percent believe they should be required to leave. Bush himself said earlier this month that a Republican candidate must be willing to "lose the primary to win the general without violating your principles. And it's not an easy task, to be honest with you." But he is one of the only Republicans who viewed as able to court Hispanic votes in 2016, not to mention praise from activists like Sharry. "He has an honest-to-goodness record on comprehensive immigration reform, he is a committed immigration reformer, and he has a proven ability to win Hispanic votes in Florida, so if - big if - if he stays true to his commitment to immigration reform, and if - big if - he survives the gauntlet that is the GOP primary season, he'll be a formidable candidate who can attract a significant percentage of Hispanic votes," Sharry told CBS News. Sharry also pointed out that the Bush brand is still a positive one among Hispanic voters. Former President George W. Bush is the most successful recent Republican candidate among Latinos, winning 35 percent of their votes in 2000 and 40 percent in 2004. During his 1998 gubernatorial campaign in Florida, Bush won 61 percent of the Latino vote (though the Hispanic population in the state tends to lean more conservative because of its strong Cuban presence). Bush also speaks impeccable Spanish and is married to a Mexican woman, Columba Bush. "His brand and his record and his family background give him a chance to compete in a way that no other GOP leading contender can claim," Sharry said. So it comes down to how well he can survive the GOP primary. "I'm pretty sure Jeb Bush will stay true to his immigration reform position," Sharry said. "I'm a lot less confident that the GOP base will embrace it."